Do you want to receive your message from the Angel? 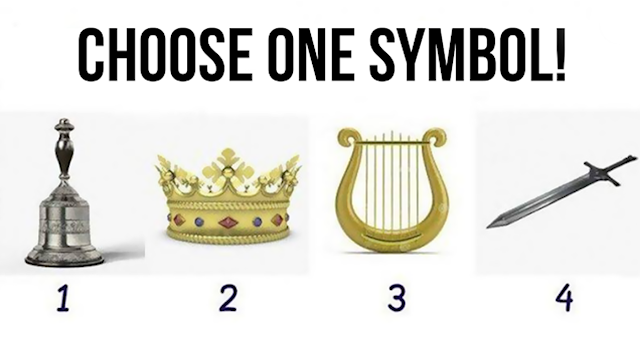 Choose one symbol! Each of these symbols has a specific purpose. Look at them carefully and choose the one that you like the most. As an angelic symbol, your choice means that you are experiencing "awakening". The sound of the bell clears stagnant energy and accelerates the emergence of new opportunities, people, interests, ideas and good health. It's like personal cleaning! Your angel puts the crown on your head as a sign of congratulation. Perhaps you were wise enough to consider your blessings, despite your problems. Angels love it when you do it because it means you become more spiritual. If you dream of a crown, be very pleased! It means you are on the path to spiritual development. The harp inspired you. The harp music has a soothing, healing effect. Your angel reports that peace, acceptance, and happiness are approaching. If you feel a little sad or disappointed, your angel calls you to relax and enjoy the time. It is the symbol of the Archangel Michael, the angel warrior. Since you chose this symbol, it means that you consciously (or subconsciously) call the Archangel to help and protect. Know that He hears you, even if you doubt your ability to contact the angels. It will help you defeat your demons (unhealthy habits, fear, negativity, and self-doubt). Translation and Adaptation by Soul Post.